Adult azalea leafminers, Caloptilia azaleella (Brants), are small, yellow moths with purplish markings on the wings. Their wingspan is about 1⁄2 inch. The leaf-mining stage is a yellowish caterpillar about 1⁄2 inch long. 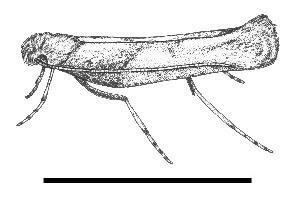 It has three pairs of prolegs found on the abdominal segments three, four and five. The proleg hooks (crochets) are singly arranged in a U-shaped pattern with a series of crochets within the U.
Azalea leafminers only damage azaleas (Rhododendron spp.) and cause two types of damage. New mines are pale and barely noticable but as mines age they leave brown blisters on the leaf surfaces. As the larva matures, it emerges from within the leaf tissue and rolls and ties the edge of a leaf around itself for protection. It continues feeding within the leaf damaging the leaf tip. Seriously injured leaves usually turn yellow and drop, thereby causing an unsightly plant. 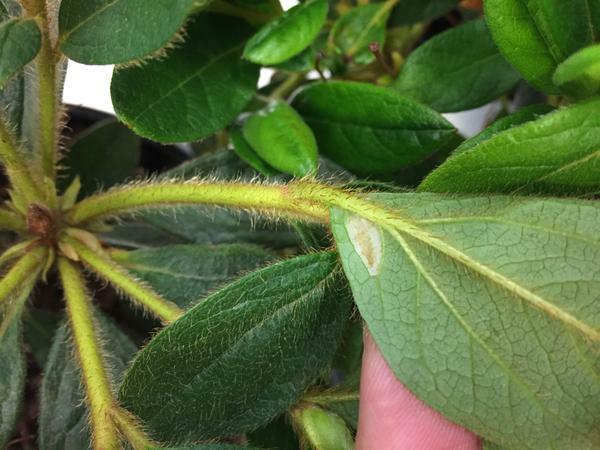 The leafminer larva has less effect on plants grown outdoors in North Carolina, but it may do considerable damage to azalea cuttings or plants in greenhouses. Brown blister formed by an old leaf mine. Figure 1. Adult moth of the azalea leafminer, Calopilia azaleela (Brants). Bar = 1 cm. Figure 2. Larva of the azalea leafminer. This is the stage that burrows within the azalea leaf. Bar = 1 cm. 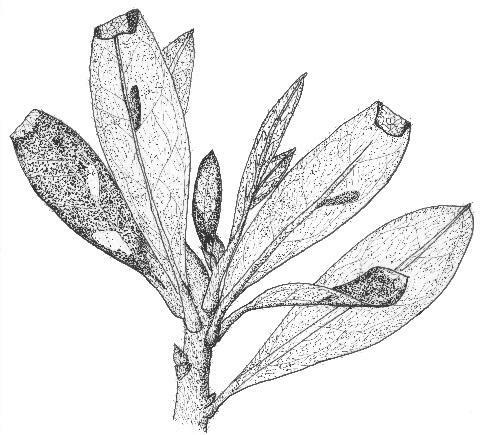 The azalea leafminer is found in most states where azaleas are grown, and azaleas are the only known host for this insect. Eggs are deposited singly on the undersides of leaves along the midribs, usually one to five per leaf. 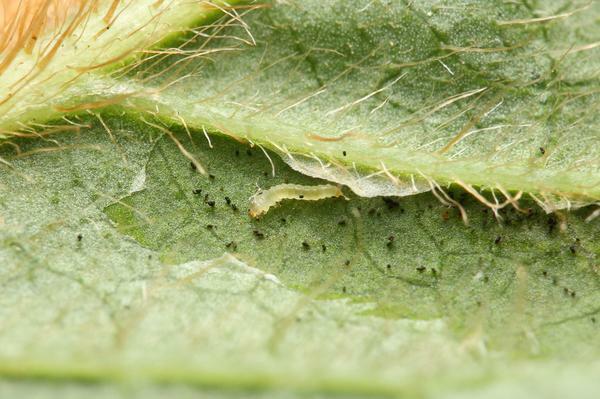 The young (larvae) hatch in about 4 days, mine into the leaves, and feed inside them. At this stage, the leaves appear to have blisters. If a leaf is held up to the light, the larvae can be seen inside. When about one-third grown, the larva emerges, moves to the tip of a new leaf and rolls it up for the protection while feeding and growing. When nearly grown, the larva rolls up the margin of the leaf and spins a cocoon inside. The moth emerges from the cocoon, mates and deposits eggs for another generation. Under greenhouse conditions, the larvae may be found at any time during the year. The insect overwinters outdoors as a larva or pupa. Adults appear and females lay eggs about the time plants bloom in the spring. Active mine opened to expose the caterpillar within. Evergreen azaleas will show damage all year. In winter inspect azaleas for leaf blisters and brown leaf tips from the previous year. These plants may be reinfested in the coming year. In late spring watch for the tiny moths on leaves and turn over leaves to look for pale active mines. The Azalea Pest Management Calendar give approximate dates of pest appearance. Management is not often necessary for azaleas in landscapes. 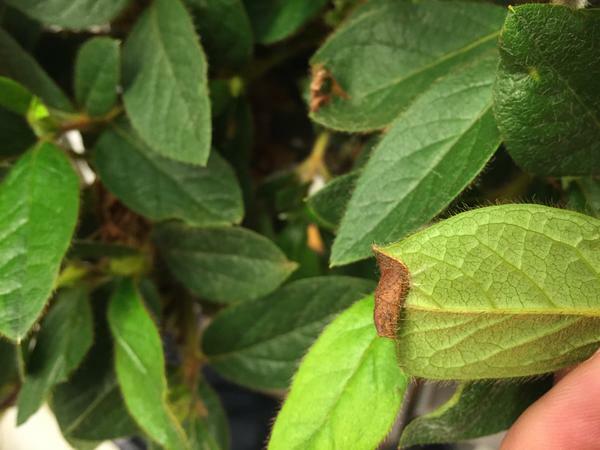 Some brown leaves are generally tolerable and the damage by leafminers is less frequent and less apparent than that of azalea lacebugs. In greenhouse potted azaleas and cuttings the damage can be more severe (greater proportion of leaves damaged) and less tolerable. In this case management may be necessary as soon as moths or mines are noticed. No standard abundance or damage thresholds exist. Cultural control: The University of Georgia has identified some azalea varieties resistant to azalea leafminer. 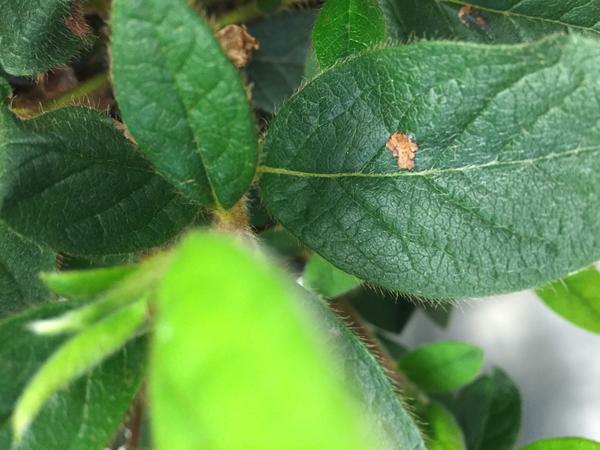 Biological control: There are some natural enemies including parasitoids that help reduce azalea leafminer abundance but no commercial options exist. Mechanical control: Hand picking or pruning infested leaves is very effective and practical as a homeowner tactic. This is not practical for large landscapes, nurseries, or greenhouses. Chemical control: Because the larva protects itself by mining into or rolling the leaf, this insect is not easy to contact with insecticides. Iinsecticides such as chlorantraniliprole, spinosad, abamectin, azadirachtin, or a pyrethroid can reduce infestations and damage when applied at the first sign (probably April-May) either of the adult moth or of foliar injury by the larvae. One or two applications, 1 to 2 weeks apart, may be necessary. Consult the North Carolina Agricultural Chemicals Manual for recommendations. For assistance with a specific problem, contact your local N.C. Cooperative Extension center.